Over time, I have accumulated some favorite cookie recipe writing tips. These simple tips help me share cookie recipes clearly with family, friends, and of course, you – right here on this site. When you share a cookie recipe, it’s helpful to have made it yourself a few times (or more) so you know that it works. Plus, by making the recipe you’ll have acquired a few personal how-to tips you can share from your experience. This section is optional, but can include number of servings, serving size, time needed to prepare the recipe, nutritional information, and even a shopping list. 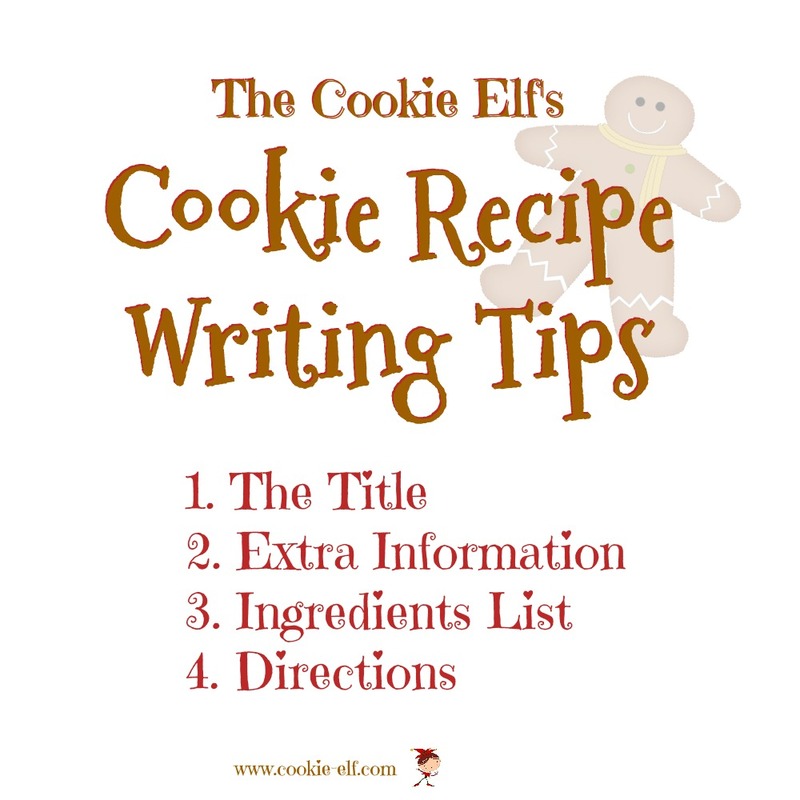 In The Cookie Elf’s recipes, you’ll see this extra information just before the list of ingredients. List ingredients vertically. Give each item its own line, rather than writing them out in a series with commas in between. Use an ordered list. List the ingredients in the order they are used to prepare the cookie recipe. Record total amounts. Record the total amount of an ingredient when is used more than once in a recipe, then add "divided" – as in “2 cups of granulated sugar, divided” where a crust calls for ½ cup and the filling calls for 1 ½ cups. The exception to that is when the recipe has a large number of ingredients, create headings for ingredients of the different parts of the recipe. A layer bar cookie recipe, for instance, may include separate ingredient lists for the crust, filling, and glaze. Write instructions step-by-step. Write the steps in order. List directions in the order they should be carried out.